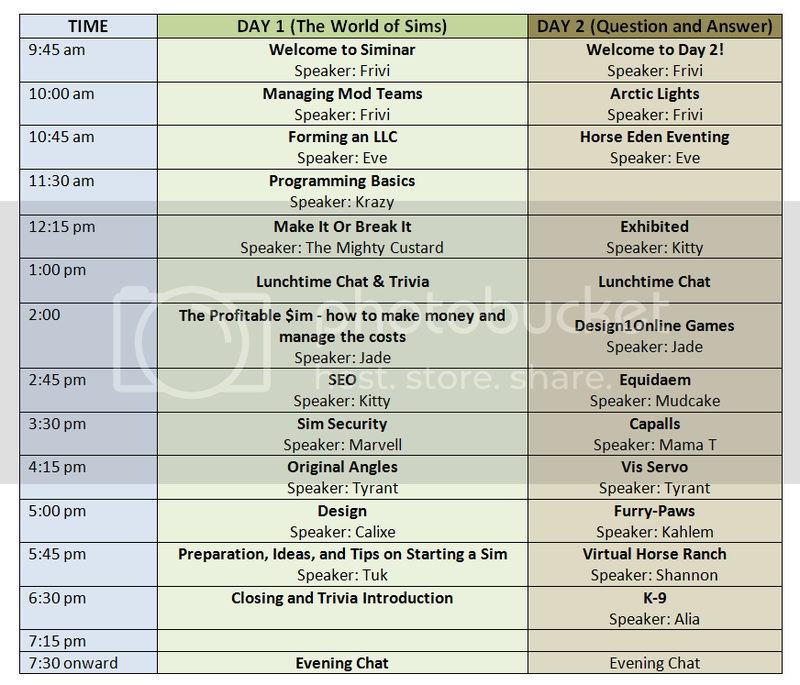 There's a really interesting event happening over this weekend and it's called Siminar. It's an online event where SIM game owners are coming together to give talks on not only their games, but also on everything from designing, to building to running your own game. I will be speaking at Siminar on Saturday AND on Sunday. The above schedule is in US Central Time, which is also the same time Exhibited runs on (so you can check EX for the current time at Siminar ;)). I'll be speaking on Day 1 (Saturday) at 2.45pm about Search Engine Optimization - all the tips and tricks involved in marketing your website. Both days I will be speaking live over a microphone and you will be able to chat with me afterwards and ask questions. To access Siminar, go here, just click this link. I hope to see you guys there!! EDIT: I'm now speaking at 11 on Exhibited. ;) Robyn from Alacrity will be speaking straight after me! Unfortunately they didn't though. Clubs have had to be manually reset this month (should be fixed for next month however) and I've manually given out the prizes for this month's club. The winner of last month was the Claw Club. All claw club members have been sent their club's summer item, the Claw Club Bracelet. This month's donation item has changed to a reeeeeeally cool item too, the Candyland Background. I've also dropped it to donating a minimum of $20 to receive this item, because I think everyone should have it. XD It's so cool. I've made continous little small updates throughout the site since the server change. - Fixed bugs. The ones I have fixed are on the forums and are "locked". - Added a "notes" link at the top for upgrades. It's just a pop-up window where you can store your own private notes! (This is especially useful for me). Alongside this I am intending to develop some more side-stats (Hunting Experience, Agility Experience, Racing Experience) etc that will be boosted in different ways. This will probably cause a revamp of dino pages to fit all the extra information in. Hey guys, I swapped servers today. Sharing with Ala and EV was great but it wasn't fair on them because EX was eating up most of the resources, so I traded us over to our own server. :D It took a while and there's still some tweaking to be done, but I think we're about there. The only thing that's down at the moment are dinosaur images. The image-creation system I use isn't properly installed on this server yet but I have a ticket filed and it should be done. In the meantime I'll be uploading a backup of the images I did have saved and when the server is done installing, all you'll have to do is click the "no image?" link and your dinosaur image will be recreated. Lay off of it for now though, because it won't work. I'll keep you posted. <3 Enjoy the speed! Lucien (#35) is going to be hosting some site trivia today at 5pm EX time. There will be an opportunity to earn scales for the site, flex your dinosaur and Exhibited knowledge, and have a whale of a time! For more information, checkout this thread. There is a new background available.. The desert! I'm aware of the site lag that Exhibited is experiencing every so often. It's not an all day thing at the moment (thank God!) but it's becoming a problem and I'm not happy with it. Exhibited is currently hosted on Alacrity's server, thanks to the wonderful Robyn, and is also alongside Equiverse, so the three games are battling it out for space right now. The three of us together are monitoring what scripts are hogging the most resources and going in straight away to optimize those scripts for speed, and save resources where we can. If by Friday the site speed hasn't improved and there are still occassional slow periods, I'll switch us over to our own server. Hopefully scale purchases will be stable enough to fund this; as a dedicated, managed server is extremely expensive. x) But so far so good! So as I promised in the chatroom, I've released the Linheraptor. I've also released a newbie pack to give you a few supplies to start the game with. I'll be working on jobs next to help new starters get some more money. Go out and refer, guys! - Dinosaur images redone. They now save to the server to ease off on so much processing power usage. (However, due to this some might be missing some - just click the "No Image?" link and it will regenerate one for you.) This means that the old dino_image.php?id=IDHERE no longer works and I've also taken the decision to disable dynamic images for dead dinosaurs, so that we free up server space. You'll still be able to put your own custom image on there, but that's about it, unless you revive them. Well, not really, but the idea I have for them will take up a LOT of time to program so I'm keeping that to myself for now. - I will also be updating the chatroom to be more conservative of space soon, too. - You can now euthanize a dinosaur if you've owned it for more than 10 days and no longer want it. You won't get a fossil from this. - I've cut down some of the payouts on the flash games so they don't pay out so much. Today I'm hoping to add a newbie tutorial/welcome screen to help integrate new players into the game and ease off the pressure on the mods from when new players repeatedly ask, "how do I get a dinosaur?" I'm also going to finish off the signup, make lottery run, do the cron for clubs and fix the donate thing, make entering your birthday mandatory (sorry! ), start dinosaurs happiness fluctuating to do with foliage states, restart enclosure enrichment items giving off their effects and remove all illnesses from current dinosaurs. The background store will also go up permenantly today as well. I'm *hoping* to try and get open today, guys, so I need your support. :) Should I manage to get enough done, I'm going to estimate about 2pm EX time everything will be open.